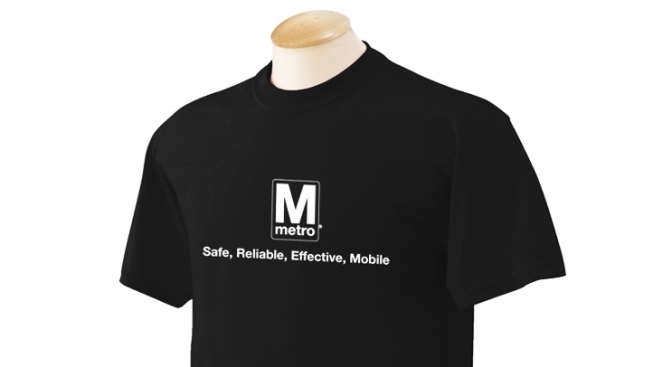 Metro: Safe, Reliable, Effective, Mobile. But it must be true if it's on a T-shirt. And it is, in sizes from small all the way up to 3X, courtesy of Metro's revamped online gift shop. In fact, the site offers seven different solid black tops with an "M" logo. And two white ones! We can hardly contain ourselves. Want a Metro pen? Sure, you can have one... along with 499 of its best friends. The site only offers quantities beginning at 500. Oh, that's only $205. Plus tax. It's Bic.Bic! Totally worth it. You could buy a pretty decent-looking Metro tote for the astonishing price of $13.55 -- but you have to buy 48 of them. Equally baffling, the tab for "Home Items" features mostly things you would use outside the home, including umbrellas, water bottles and travel coffee mugs (which you can't actually use on Metro, anyway). There's a 69-cent keychain... oh, but you have to buy 500. Not everything must be purchased in bulk, though. On its "Technology" tab, the gift shop offers a women's watch or a men's watch ($195). Sure, there's nothing else in terms of technology offered on that page, but we all know technology hasn't advanced much since reliable timekeepers were developed, anyway. You can also purchase a $25 Metro map (dimensions unspecified, notes EmilyHaha). Hang it on your living room wall, and watch your commute-related stress never evaporate! This gift shop is the gift that keeps on giving. At least in terms of amusement. If you're looking for creative Metro items, we suggest looking here.